When I was in elementary school, my grandmother always made gingerbread cookies during the Holiday season. She would decorate them with icing and I decorated them with little candies. I had forgotten about that childhood memory until this year. I had never really made gingerbread cookies, because my mom always made normal sugar cookies for the holidays and this was a tradition that I couldn't change, even though I never liked those cookies very much. [ She's going to kill me if she reads that! ] We decorated them with so much colored sugar, candy sprinkles and other artificial tasting decorations that it was like we were only eating the decorations and not the cookies. Since I'm the one who bakes and cooks in the house, my mom and my brother begged me to make Christmas cookies this year again, so I chose to bake yummy gingerbread cookies instead of the tasteless sugar cookies! I found the recipe in a cooking magazine. In a large bowl, mix the flour, the spices and the baking soda. Heat the butter, the brown sugar, the honey and the molasses at medium heat, stirring until the butter and the sugar have melted. Pour the warm syrup over the flour mixture and mix with a wooden spoon. Add the egg and mix until the dough is soft and doesn't stick to your hands. Add a bit of flour if it's too sticky. Let it stand a few minutes. On a floured surface, roll the dough with a rolling pin until it's thin like unbaked pie dough. 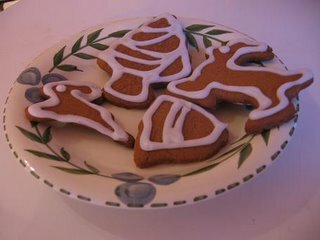 Cut out many shapes with cookie cutters, place on nonstick baking sheets and bake in the oven 8 to 10 minutes, depending on how large the cookies are. For the icing, just stir two cups of confectioner's sugar with a few tablespoons of water, and pipe on the cookies with a pastry bag. posted by Clara at 8:22 a.m.
C'est une très belle recette. Je vais l'essayer! Je suis revenue les voir, tes biscuits! Juste pour savoir si tout va bien pour toi. My name is Ray and I just started a new blog about how to make a good confession. Its a place where you can chat about how to make a good confession confidentially. I hope you will come and check out www.MySecretConfessionSpace.com. Thanks for letting me post on your site. What precisely is a book, young woman? I have some knowledge of forex investing but not that much. I am wanting to find a website where all you have to do is invest money and they do the rest with trading, etc. Does anyone know of any of these sites? בית מלון [url=http://www.kfarbair.com]כפר בעיר[/url] - אווירה כפרית, [url=http://www.kfarbair.com/about.html]חדרים[/url] מרווחים, שירות חדרים, אינטימיות, שלווה, [url=http://kfarbair.com/services.html]שקט[/url] . אנו מציעים שירותי אירוח מגוונים גם ישנו במקום שירות חדרים המכיל [url=http://www.kfarbair.com/eng/index.html]סעודות רומנטיות[/url] במחירים מפתיעים אשר יוגשו ישירות לחדרכם. I'm in a love/hate relationship with digital memory because of how prices are always falling. I hate buying SD Cards for my R4 / R4i at (what seems to be) a bargain price only to see it become 10% cheaper a few weeks later.